For press use: Please feel free to use this language to accurately report on the U.S. migration to chip cards. Attribution to the U.S. Payments Forum is optional. How can I describe the U.S. move to chip cards? The U.S. is moving to new chip cards based on a global standard called EMV, already in use in billions of payment cards worldwide, to enhance in-person payment security for consumers, merchants and issuers. How can I describe the security features of chip cards? EMV chip cards contain secure computer chips that validate the authenticity of the card and include a one-time use security code in every transaction, making chip payment data virtually impossible to use for counterfeit card fraud. How can I describe the drivers for U.S. chip migration? The U.S. move to EMV chip payments is being driven by the payments industry’s desire to reduce card fraud in a face-to-face card-present environment, provide global interoperability, and enable safer and smarter transactions across contact and contactless channels. How can I describe the fraud liability shifts? “Fraud liability shifts” for card issuers and merchants are meant to help synchronize the timelines to move all industry stakeholders to implement chip technology. As of October 2015, the payment brands shifted the responsibility for certain types of fraud fraud resulting from a payment transaction to the party using the least secure technology. There are different liability shifts for ATMs (October 2016 and October 2017) and automated fuel dispensers (October 2017). How can I describe when consumers will start using chip technology? Many consumers will receive chip cards from their banks this year and will increasingly be able to use them to pay at merchant locations throughout the U.S.
Is there any terminology I should avoid in reporting on chip cards? 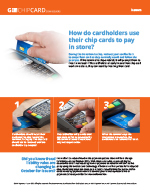 It is not accurate to refer to the U.S. use of chip payment technology as “chip and PIN.” Not all chip cards issued in the U.S. will require the use of a PIN. EMV is the name of the global standard for chip payment cards and is based on widely used and highly secure smart card technology. 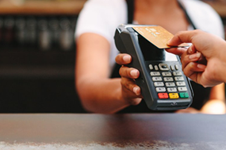 EMV specifications are maintained by EMVCo. Chip payment cards are standard-sized bank cards that have a microprocessor, or a mini computer, embedded in the card that meet requirements of the EMV standard. Today, the U.S. is in the midst of migrating to chip payments. The U.S. market is larger than all of Europe’s payments markets combined, making it the largest individual market to convert to chip cards. As of October 2015, the payment brands shifted the responsibility for certain types of fraud resulting from a payment transaction to the party using the least secure technology. If neither or both parties are EMV compliant, the fraud liability remains with the issuer. Today, more than half of the cards in the U.S. are chip cards, and 1.7 million U.S. POS terminals are enabled to accept them. The embedded microprocessor (computer) in a chip card provides strong transaction security features and other application capabilities not possible with traditional magnetic stripe cards. The first way is the storage of the cardholder data and security keys inside the chip. Even if chip data were to be copied, it could not be used to create another chip card using the same data. The second way is by a one-time, unique code, called a cryptogram, generated by the chip during each payment transaction. The cryptogram proves that the card is authentic and that the transaction data was unique to that card. Therefore, any use of the same unique card data would be detected by the issuer and the transaction denied. EMV chip transaction data excludes other data needed for magnetic stripe transactions, so it cannot be used to make a fraudulent transaction in an EMV or magnetic stripe environment. Since 2002, Randy has been serving as the full time Executive Director of the Smart Card Alliance, a not-for-profit, multi-industry association working to stimulate the understanding, adoption, use and widespread application of smart card technology. Randy also serves as the director of the U.S. Payments Forum (formerly the EMV Migration Forum), the a cross-industry body focused on supporting the introduction and implementation of EMV chip and other new and emerging technologies that protect the security of, and enhance opportunities for payment transactions within the United States. The U.S. Payments Forum has an active communications program to promote industry messages in business, vertical market, and technology publications. Coverage results from both Forum press releases and interviews with publications writing articles about the Forum. Selected recent coverage can be seen online, http://www.emv-connection.com/us-payments-forum/forum-in-the-news/.